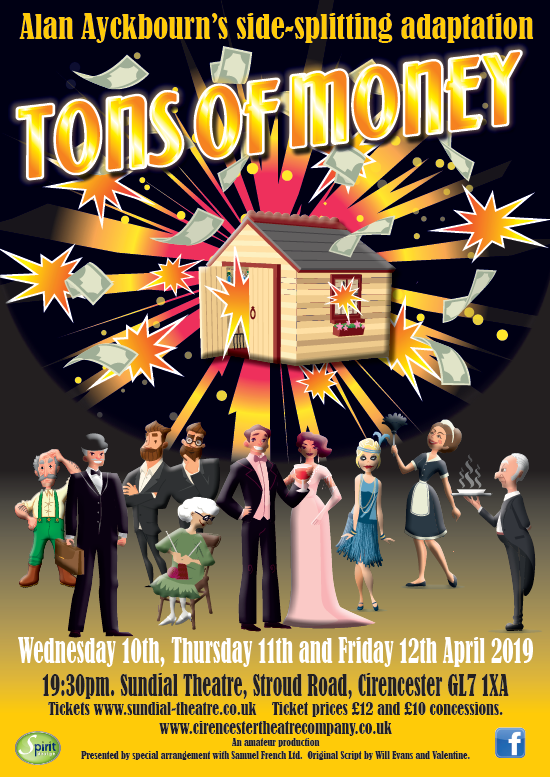 Adapted by Alan Acykbourn, Tons of Money is one of the famous Aldwych Farces, and has all the ingredients for a riotous night’s entertainment – a convoluted plot, various disguises, mistaken identities and everyone racing around trying to save the day! Meet Aubrey and Louise – they are stony broke. Louise has an idea – as she often does. And then there’s Aunty – you’ll love her – despite her deafness..
And Louise’s dear dizzy friend Jean who faints a lot..
And when Cousin George shows up from Mexico the confusion and mayhem ensues. With many twists and turns, and a frantic pace you will love this side-splitting, rolling in your seat, riotous comedy. Escape from the real world and come and enjoy the madness! From the Theatre Company who brought you the highly successful Brassed Off in 2018.